Two new “200 Series” models have been added to the “F Series”. The LTD F-200B is a baritone guitar (27” scale) with 24 frets and bolt-on construction, providing an affordable solution for metal and hard rock players. 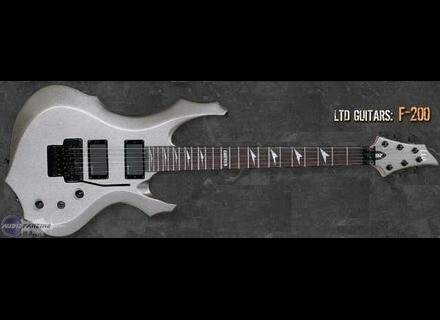 The LTD F-200FR also features the angular curves of the F shape in a standard scale model with a Floyd Rose tremolo. Another new baritone guitar model announced is the LTD Viper-200B, which features the double-cutaway styling of the Viper model in a 27” scale guitar priced for almost any musician. 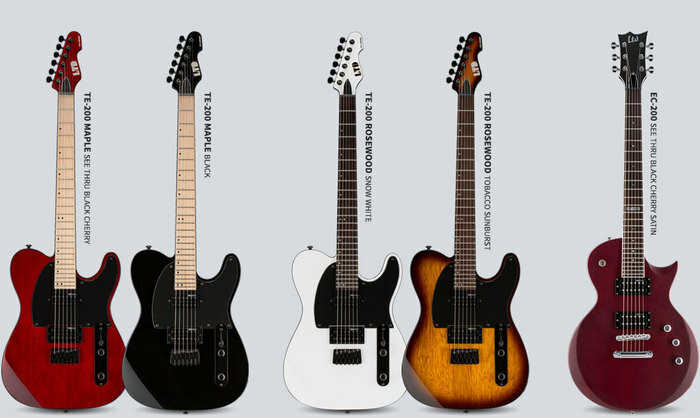 LTD’s recently-announced SN Series now has five new guitars in the affordable “200 Series”. These guitars combine traditional shapes with modern design touches and performance tools. The LTD SN-200FR Maple is available in Black Cherry Metallic Satin and Charcoal Metallic finishes, and includes Floyd Rose tremolos and ESP Designed pickups. 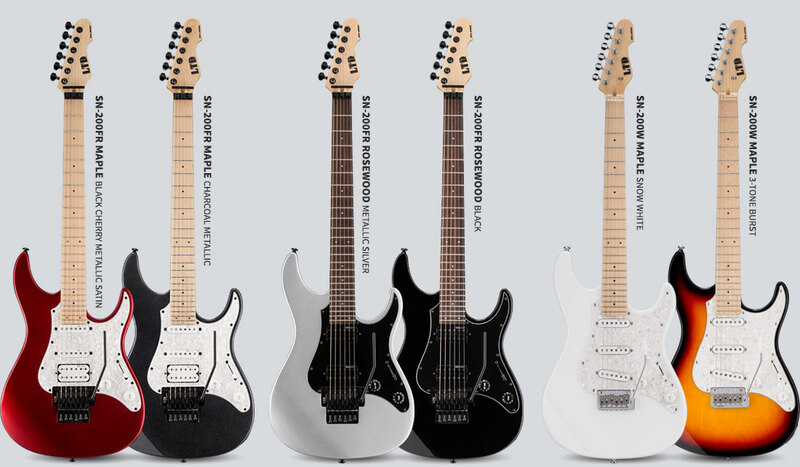 The same models are available with a rosewood fingerboard in the SN-200 Rosewood, which come in Metallic Silver and Black finishes. Similarly, the LTD SN-200W Maple features a Wilkinson tremolo, and comes in 3-Tone Sunburst or Snow White finishes, while the SN-200W Rosewood comes in Copper Sunburst finish. Another addition to the SN Series is the SN-200HT, a hardtail version of the guitar with string-thru-body design in Snow White finish. The TE Series also has new choices in the 200 range. 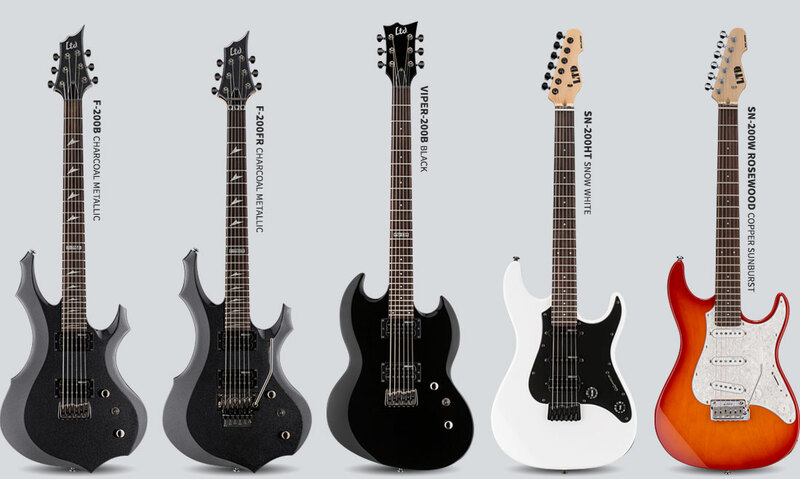 These guitars have been redesigned for modern performance vibe with an elbow cut and an angled headstock. The TE-200 Maple comes in See Thru Black Cherry or Black finishes, and provides a 24-fret, mahogany-bodied, fixed bridge solution to TE enthusiasts. The same goes for the TE-200 Rosewood, which comes in Tobacco Sunburst and Snow White finishes. Finally, the EC-200 model has been refreshed with a new See Thru Black Cherry Satin finish. [NAMM] Blackstar introduces Fly 3 Union Flag Blackstar has presented a special Union Flag version of the Fly 3 mini amplifier.